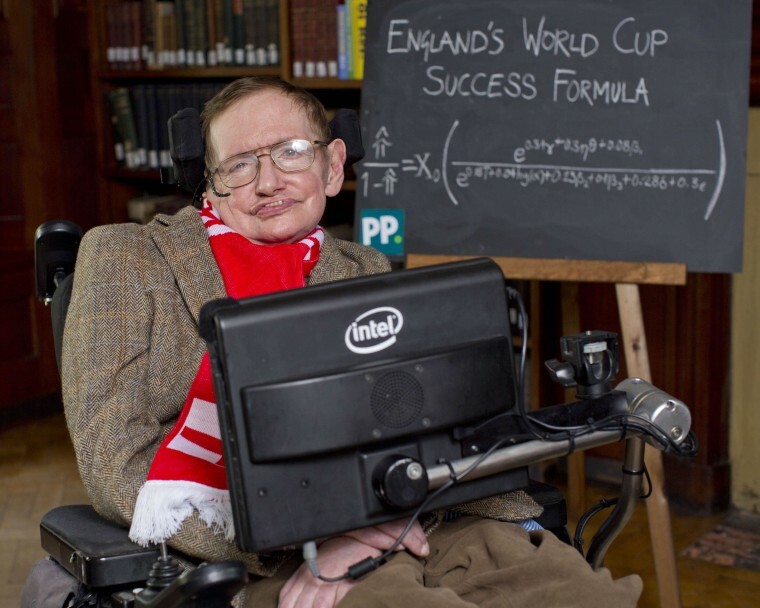 World-famous physicist Stephen Hawking may not be that great of a gambler, but he certainly knows the territory when it comes to handicapping World Cup soccer. The 72-year-old professor, who has had to cope with a different kind of handicap for decades, offered his perspective on this year's mega-event in Brazil — and England's chances of winning the prize — in a commentary penned for Paddy Power, an Ireland-based online betting site. "I always saw Paddy Power as slightly anti-intellectual but by inviting me to be a pundit, they have proved me wrong," Hawking jokes. "They recognized that as a theoretical physicist I'm marginally more qualified to make predictions than Paul the Octopus." During a London news conference, Hawking said making sense out of soccer was a "hugely complicated" task. "Compared to football, I think quantum physics is relatively straightforward," he said Wednesday, speaking from his wheelchair using a voice synthesizer. Hawking's analysis for Paddy Power is a statistical tour de force, running the gamut from the preferred color of uniforms (red is best for building confidence) to the referees (63 percent of England's games were won when the ref was European) to the best time for a game (3 o'clock). Should the players' wives and girlfriends show up? "Contrary to tabloid opinion, the presence of WAGs is irrelevant," Hawking says. What is relevant, however, is home-field advantage. Hawking notes that the World Cup has gone to the host country more than 30 percent of the time. "All mathematics, science and rational thought go out the window when England are on," Hawking writes. "I am an Englishman and will be cheering our boys all the way to the final in Rio... But my money is on Brazil." England is currently facing, at best, 25-to-1 odds of winning the World Cup. But considering Hawking's notoriously bad gambles — for instance, over the existence of the Higgs boson, the nature of Cygnus X-1 and what happens to the information lost in a black hole — having him bet on someone else may turn out to be England's best hope.